Will putting flowers in cages restore this rare and declining British bumblebee? A first-of-its kind project hopes to restore populations of one of the UK’s rarest bumblebees. It has been launched on the Peak District moors near Sheffield, England this month, with support from the National Lottery. Bilberry bumblebees have suffered a dramatic decline in recent years. They were once found widely across north and west Britain, but the Peak District is now one of their last strongholds. Even here, this cold-loving upland species is expected to decline further because of climate change. The Bumblebee Conservation Trust and the Eastern Moors Partnership—which is a joint initiative between the National Trust and the RSPB—aim to revive populations of the threatened Bilberry bumblebee by planting 1,000 bilberry plants inside specially-designed grazing-proof metal cages on Hathersage Moor. Bilberry is a vital food source for the declining bumblebee. It flowers in the spring and early summer, before heathers and other moorland plants, and is essential for the bees and their larvae as the nests are established. “This hands-on project is the first attempt to help Bilberry bumblebees and bilberry plants survive and thrive together like this,” she added. 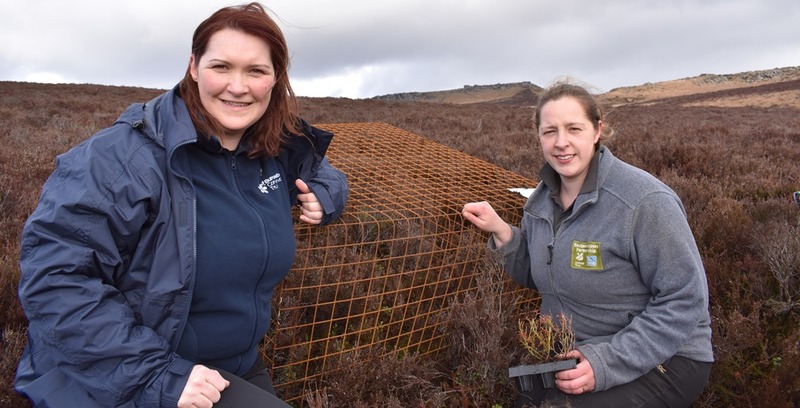 This month, bilberry has been planted across 60 acres of Hathersage Moor, then protected by cages built by Bumblebee Conservation Trust and Eastern Moors volunteers and youth rangers. Past grazing pressure on the moor has led to a lack of mature bilberry bushes favoured by the bee. The project will build on changes over recent years in how the moor is managed, which have seen bilberry beginning to make a comeback. The grazing cages will allow Bilberry bumblebees to enter to feed and nest while protecting the growing plants during their early years, by keeping livestock out. They are designed to blend into the landscape and will be left in place, maintained by Eastern Moors volunteers, until the plants are established. This joint venture is part of the Bumblebee Conservation Trust’s Pollinating the Peak project, made possible thanks to National Lottery players following a £720,000 National Lottery Heritage Fund grant. The initiative will also allow researchers to gather vital new data about the bees, and the plants’ growth. There has only been a handful of Bilberry bumblebee studies, and no research in the Peak District for decades. A general lack of bumblebee records in Derbyshire means the species could be declining faster than has been thought. Tackling this data gap means conservation action can be taken before it’s too late. This summer, volunteers will begin monitoring bumblebees on Hathersage Moor through the Bumblebee Conservation Trust’s national BeeWalk recording scheme – a citizen science survey that provides early warning of bee declines. The volunteers will identify and count bumblebees they see while walking the same fixed route each month between March and October. Eastern Moors volunteers will continue the monitoring in future years. Also known as the Blaeberry or Mountain bumblebee, the rare bee is found almost exclusively on bilberry-rich moorlands. It has helped keep the bilberry plant alive for centuries through pollination. 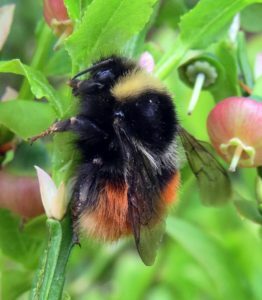 The Eastern Moors Partnership, which manages Hathersage Moor on behalf of Sheffield City Council, has now identified the Bilberry bumblebee as a key species indicator – a species that is rapidly affected by environmental changes and so can give early warnings that a habitat is suffering. Pollinating the Peak is also creating flower-rich habitats, monitoring bumblebees and raising awareness about them across the Peak and Derbyshire. It is run with partners Chatsworth, Chesterfield Borough Council, Derbyshire County Council, Derbyshire Wildlife Trust, Little Green Space, Moors for the Future Partnership, National Trust, and Peak District National Park. Featured photo shows Sally Cuckney & Rebecca Wood (Assistant Warden at the Eastern Moors Partnership.) Credit: Bumblebee Conservation Trust. See the Bumblebee Conservation Trust website.